A dependable car like the 2018 Volkswagen Jetta is a great way to get around West Valley, Murray City and Orem. But even in a safe, reliable car, it’s important to know what all your safety warnings and routine maintenance alerts are. To help you stay informed during your drive, Volkswagen SouthTowne put together this review of some of the most important Volkswagen Jetta dashboard symbols. Let’s begin with one of the most important systems in your car, the transmission. When there is a malfunction with your automatic transmission, you’ll see a yellow light that looks like an exclamation mark (!) inside a gear symbol. If you see this on your dashboard, it’s recommended that you immediately take your car in for service. Your coolant light is red and will appear in the center screen next to your speedometer. This icon looks like it has waves on the bottom and a thermometer in the center. It’s recommended that you check the coolant levels and then the owner’s manual. It may be that your engine is in danger of overheating. Our next light is a combination of the previous two. If your Volkswagen Jetta has a manual DSG® transmission, this is a very important light. It will appear as red and show the thermometer symbol inside the gear logo. If you see this, it means that your gearbox is overheating, and you should stop immediately to let the transmission cool off. The next light is one of the clearest. If a yellow light that says the letters ABS comes on, there is likely a malfunction with your anti-lock brakes. This will usually be located on the right-hand side, toward the top of your speedometer. You’ll still be able to bring the car to a complete stop, but you won’t have the added protection of anti-lock brakes. Sticking with the brake system, the next symbol is a yellow light that looks like it has a lightbulb inside a circle that’s bordered by parentheses. This indicates that one or more of your brakes lights are out. While this doesn’t pose an immediate danger, you should get a new light bulb installed as soon as possible to keep other drivers aware of when you’re slowing down to prevent accidents. A similar light indicates a more serious issue with the brakes. A yellow light with a circle that’s bordered by some dashes is meant to alert you of when you brake pads start to wear down. This is routine maintenance, but you don’t want to ignore this light. Your brake pads are crucial to being able to stop effectively. Our final brake light is red and looks like an exclamation mark (!) inside a circle, surrounded by parentheses. This indicates that the parking brake is on. If it is on, disengage the parking brake. If the parking brake is not locked in place, it may mean that there is either low brake fluid or a problem with the ABS. A yellow light that looks like an exclamation mark (!) 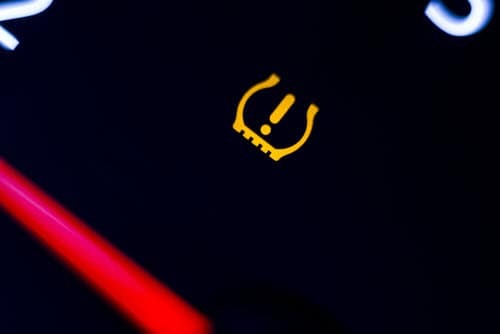 surrounded by a horseshoe means that your tire pressure monitoring system has either detected low tire pressure or the system is malfunctioning. It’s a good idea to check your tire pressure. If it is already within the guidelines in your owner’s manual, it’s recommended you get the system looked at. One of the most important lights for your immediate safety is your power steering light. This light looks just like your steering wheel. If it is solid yellow, it means that your power steering assist system isn’t working at 100%. If it is flashing yellow, it means there has been a malfunction in the electronic steering column. If it is solid red, there’s been a full failure in the power steering assist system. Lastly, if it is flashing red, the malfunction in your electronic steering column is severe, and you’ll hear an audible warning as well. In all cases, it’s advised that you stop the car immediately and call for service. The final light we’ll touch on is for one of the most common forms of routine maintenance. If you see a yellow light with a logo that looks like an old-fashioned oil can or a flatter looking tea kettle with a single droplet coming out, that means your oil levels are low. This is an early warning sign that it’s time for a routine oil change. We hope that you found this review of the 2018 Volkswagen Jetta dashboard symbols helpful. If you experience any of these or other service issues, or have additional questions, schedule service online or stop by Volkswagen SouthTowne.